Lieutenant Gary Gribbons has been a member of the Sheriff's Office since November, 1989 and has worked his way through the ranks of Patrol Deputy, Patrol Sergeant, and Lieutenant. He is the Division Commander in charge of law enforcement division, which consists of the road patrol, detective bureau, and court services. 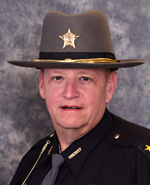 Lieutenant Gribbons is a graduate of Lakeland Community College, The Ohio State Highway Patrol Academy, Northwestern University’s School of Police Staff and Command, The FBI National Academy, session 205, Penn State University’s Police Executive Development Program, and a 2003 Leadership Geauga graduate. Additionally, Lieutenant Gribbons is recognized as a Certified Law Enforcement Manager through the Buckeye State Sheriff’s Association. Lieutenant Gribbons received his bachelor’s degree in the Administration of Criminal Justice in 2003.